Dubai: Rare blood types are in greater demand in the UAE, despite only a small percentage of the population having negative blood groups, the Dubai Blood Donation Centre revealed on Monday. While all blood types are needed, negative blood types are in greater demand due to their rarity, the centre said in a statement, revealing that only 0.6 per cent of the UAE population are AB negative, 1.8 per cent are B negative, 2.4 per cent are A negative and 4 per cent are O negative. The most common blood type in the country is O positive, found in 38.6 per cent of the population. “There is a continuous demand for all blood types, as blood lasts for only 42 days and so donors are always needed to come forward to replenish these stocks. People can donate blood every eight weeks, with each donation potentially saving up to three lives. 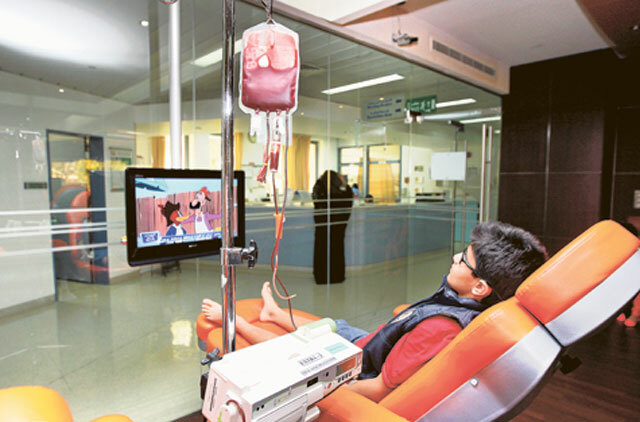 Platelets, which can be donated up to 24 times a year, are also important to help cancer patients undergoing chemotherapy or those recovering from surgery and suffer from blood loss,” said Dr. Mai Raouf, Director of the Dubai Blood Donation Centre. Dr. Raouf revealed earlier that in 2018 the centre received 63,735 blood donors, 50,456 blood units were collected in 2018, while 4,741 apheresis platelets and 480 concentrated blood units were collected through the Apheresis system during the same year. She added that 635 blood donation campaigns were held in 2018 and 11,118 blood units were distributed to private hospitals. The Dubai Blood Donation Centre is the only blood donation centre in Dubai, providing around 50 per cent of the total blood collected throughout the country. Recently, Shaikh Hamdan Bin Mohammad Bin Rashid Al Maktoum, Crown Prince of Dubai and Chairman of the Executive Council, launched a three-year countdown for implementing the Dubai Paperless Strategy.